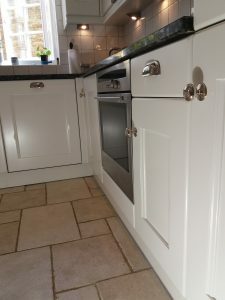 This bespoke kitchen had been fitted 13 years ago and had darkened from the original ash finish, The client found our website and discovered that we carried out the Hand Painting for Bell the leading bespoke kitchen supplier in Northamptonshire, Over 100 years in business . I explained to the clients the process we go through. 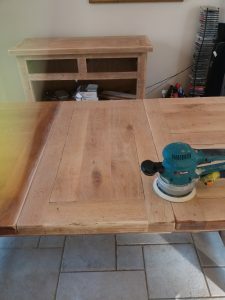 After deep cleaning with a degreaser and a complete sand down, I would prime with Tikkurila otex adhesion paint, this would also act as a stain block incase of any tanning bleeding through the paint film. 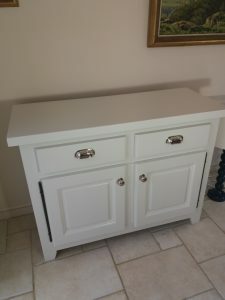 I then applied a 2nd coat as an undercoat and completed with Benjamin Moore Advance satin waterborne top coats. 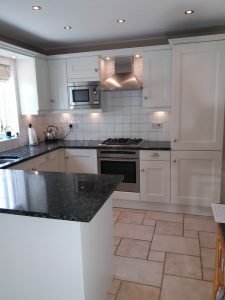 The clients where delighted with another example of what is possible with a very well made bespoke wooden kitchen. 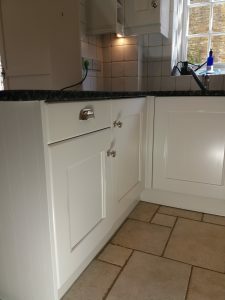 Notice how the new handles we fitted really stood out against the off white paint finish, On this refurbishment we also supplied and fitted Blum soft close hinges, A nice little affordable upgrade to any kitchen fitted with cabinet hinges. The sheen level on the Advance Benjamin Moore Satin Finish is a 30% Level, We can also paint your kitchen in a 10% semi matt finish if you prefer. The new paint system would have been touch dry the same day and been usable within a couple of days. It would have been fully cured after around 28 days. At this point the surface paint is at its peak durability. 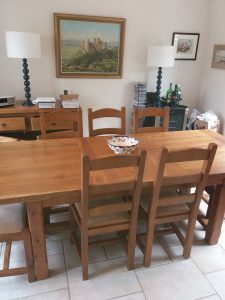 On this refurbishment we also Hand Painted a free standing side board, A dining room table and set of chairs made from solid Oak from John Lewis to match the kitchen cabinets. 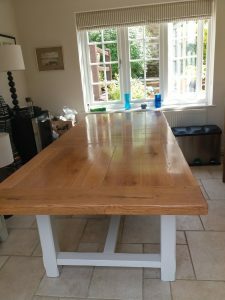 The table top was left natural, after sanding back to clean oak we then applied 3 coats of worktop finishing oil in a satin finish, A very durable and an attractive finish, With the table legs and frame work Hand Painted, Paint and Oak are always a great combination in a kitchen and lift the whole look of the furniture bringing it up to a new modern look. 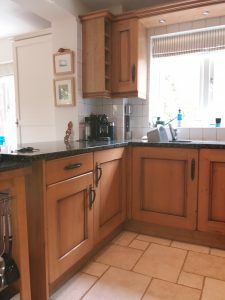 The clients decided to have the chairs Hand Painted in 3 different colours, All 9 of them, they turned out to be a real stand out feature in this kitchen refurbishment, They also had the seats re- upholstered in a nice shade of blue. 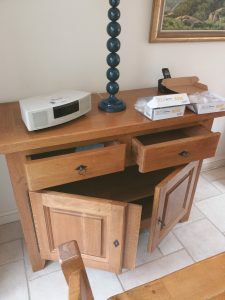 With my son we cover Northants, Beds, Bucks & Herts, I have been painting kitchens since the early 80s and there is not much i have not seen or solved. We normally work on around at least a 3 month lead time, So its best to plan well ahead. 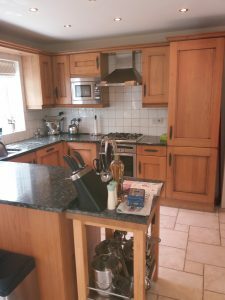 This Video shows what you can expect if we refurbish and hand paint your kitchen. 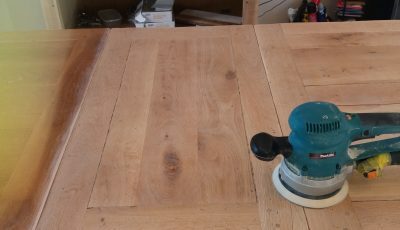 Our oak kitchen which had been fitted 13 years ago had darkened from the original ash finish it had turned to a dark wood. The upheaval of having a new fitted kitchen was not too appealingly, so we were so pleased to discover Paul Barber’s website and to find out that he did the hand painted kitchens for the leading kitchen supplier in Northampton.The results are stunning, not only does the kitchen look new and finished to an extremely high quality Paul also agreed to paint a sideboard and base of the matching oak table. 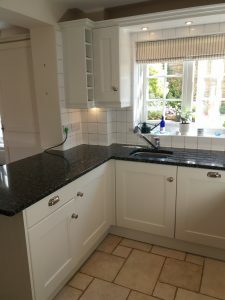 We have saved thousands of pounds and believe we have a kitchen which is customised to our own taste and colours . Paul is so helpful and is now going to work on some chairs for us. We can highly recommend his services.